Here's another big sale to watch out for this month. 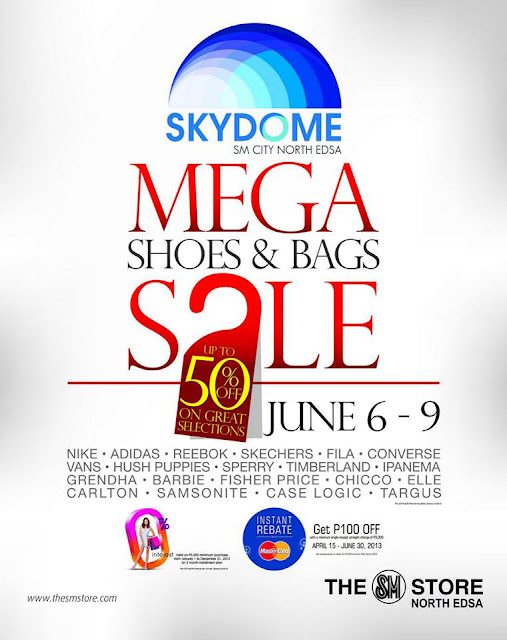 Aside from Megamall's Freedom sale from June 8-June 12, 2013, SM Skydome at SM NORTH EDSA will be having MEGA shoes and bags sale for everyone. Sale will be up to 50% OFF on great selections from June 6 - 9, 2013! Brands like Nike, Adidad, Reebok, Ipanema and more will be on sale. Hurry this is going to be fun shopping!